NASA’s JUNO spacecraft successfully swooped over the Jovian cloud tops today, Saturday, Aug. 27, gathering its first up close images and science observations of the ‘King of the Planets’ since braking into orbit on America’s Independence Day. Saturdays’ close encounter with Jupiter soaring over its north pole was the first of 36 planned orbital flyby’s by Juno during the scheduled 20 month long prime mission. “Soarin’ over #Jupiter. My 1st up-close look of the gas-giant world was a success!” the probe tweeted today post-flyby. NASA released Juno’s first up-close image taken by the JunoCam visible light camera just hours later – as seen above. Juno was speeding at some 130,000 mph (208,000 kilometers per hour) during the time of Saturday’s closest approach at 9:44 a.m. EDT (6:44 a.m. PDT 13:44 UTC) over the north polar region. It passed merely 2,600 miles (4,200 kilometers) above the turbulent clouds of the biggest planet in our solar system during its initial 53.5 day polar elliptical capture orbit. And apparently everything proceeded as the science and engineering team leading the mission to the gas giant had planned. “Early post-flyby telemetry indicates that everything worked as planned and Juno is firing on all cylinders,” said Rick Nybakken, Juno project manager at NASA’s Jet Propulsion Laboratory in Pasadena, California, in a statement. Indeed Saturday’s encounter will count as the closest of the entire prime mission. It also marks the first time that the entire suite of nine state-of-the-art science instruments had been turned on to gather the totally unique observations of Jupiter’s interior and exterior environment. “We are getting some intriguing early data returns as we speak,” said Scott Bolton, principal investigator of Juno from the Southwest Research Institute in San Antonio, in a statement. Additional up-close high resolution imagery of the Jovian atmosphere, swirling cloud tops and north and south poles snapped by JunoCam will be released in the coming weeks, perhaps as soon as next week. “We are in an orbit nobody has ever been in before, and these images give us a whole new perspective on this gas-giant world,” said Bolton. The prime mission is scheduled to end in February of 2018 with a suicide plunge into the Jovian atmosphere to prevent any possible contamination with Jupiter’s potentially habitable moons such as Europa and Ganymede. The team did release an approach image taken by JunoCam on Aug. 23 when the spacecraft was 2.8 million miles (4.4 million kilometers) from the gas giant planet on the inbound leg of its initial 53.5-day capture orbit. One additional long period orbit is planned. The main engine will fire again in October to reduce the orbit to the 14 day science orbit. The $1.1 Billion Juno was launched on Aug. 5, 2011 from Cape Canaveral Air Force Station, Florida atop the most powerful version of the Atlas V rocket augmented by 5 solid rocket boosters and built by United Launch Alliance (ULA). That same Atlas V 551 version recently launched MUOS-5 for the US Navy on June 24. The Juno spacecraft was built by prime contractor Lockheed Martin in Denver. The last NASA spacecraft to orbit Jupiter was Galileo in 1995. It explored the Jovian system until 2003. In the final weeks of the approach before Jupiter Orbit Insertion (JOI), JunoCam captured dramatic views of Jupiter and all four of the Galilean Moons moons — Io, Europa, Ganymede and Callisto. At the post JOI briefing at JPL on July 5, these were combined into a spectacular JunoCam time-lapse movie released by Bolton and NASA. Watch and be mesmerized -“for humanity, our first real glimpse of celestial harmonic motion” says Bolton. NASA’s newly arrived Jovian orbiter Juno has transmitted its first imagery since reaching orbit last week on July 4 after swooping over Jupiter’s cloud tops and powering back up its package of state-of-the-art science instruments for unprecedented research into determining the origin of our solar systems biggest planet. The breathtaking image clearly shows the well known banded cloud tops in Jupiter’s atmosphere as well as the famous Great Red Spot and three of the humongous planet’s four largest moons — Io, Europa and Ganymede. The ‘Galilean’ moons are annotated from left to right in the lead image. Juno’s visible-light camera named JunoCam was turned on six days after Juno fired its main engine to slow down and be captured into orbit around Jupiter – the ‘King of the Planets’ following a nearly five year long interplanetary voyage from Earth. The image was taken when Juno was 2.7 million miles (4.3 million kilometers) distant from Jupiter on July 10, at 10:30 a.m. PDT (1:30 p.m. EDT, 5:30 UTC), and traveling on the outbound leg of its initial 53.5-day capture orbit. Juno came within only about 3000 miles of the cloud tops and passed through Jupiter’s extremely intense and hazardous radiation belts during orbital arrival over the north pole. “This scene from JunoCam indicates it survived its first pass through Jupiter’s extreme radiation environment without any degradation and is ready to take on Jupiter,” said Scott Bolton, principal investigator from the Southwest Research Institute in San Antonio, in a statement. Within two days of the nerve wracking and fully automated 35-minute-long Jupiter Orbital Insertion (JOI) maneuver, the Juno engineering team begun powering up five of the probes science instruments on July 6. All nonessential instruments and systems had been powered down in the final days of Juno’s approach to Jupiter to ensure the maximum chances for success of the critical JOI engine firing. “We had to turn all our beautiful instruments off to help ensure a successful Jupiter orbit insertion on July 4,” said Bolton. Juno resumed high data rate communications with Earth on July 5, the day after achieving orbit. We can expect to see more JunoCam images taken during this first orbital path around the massive planet. But the first high resolution images are still weeks away and will not be available until late August on the inbound leg when the spacecraft returns and swoops barely above the clouds. “JunoCam will continue to take images as we go around in this first orbit,” said Candy Hansen, Juno co-investigator from the Planetary Science Institute, Tucson, Arizona, in a statement. All of JunoCams images will be released to the public. During a 20 month long science mission – entailing 37 orbits lasting 14 days each – the probe will plunge to within about 2,600 miles (4,100 kilometers) of the turbulent cloud tops. The solar powered Juno spacecraft approached Jupiter over its north pole, affording an unprecedented perspective on the Jovian system – “which looks like a mini solar system” – as it flew through the giant planets intense radiation belts in ‘autopilot’ mode. Juno is the first solar powered probe to explore Jupiter or any outer planet. In the final weeks of the approach JunoCam captured dramatic views of Jupiter and all four of the Galilean Moons moons — Io, Europa, Ganymede and Callisto. At the post JOI briefing on July 5, these were combined into a spectacular JunoCam time-lapse movie released by Bolton and NASA. The $1.1 Billion Juno was launched on Aug. 5, 2011 from Cape Canaveral, Florida atop the most powerful version of the Atlas V rocket augmented by 5 solid rocket boosters and built by United Launch Alliance (ULA). That same Atlas V 551 version just launched MUOS-5 for the US Navy on June 24. The mission will end in February 2018 with an intentional death dive into the atmosphere to prevent any possibility of a collision with Europa, one of Jupiter’s moons that is a potential abode for life. From Earth’s perspective, Jupiter was in conjunction with Earth’s Moon shortly after JOI during the first week in July. Personally its thrilling to realize that an emissary from Earth is once again orbiting Jupiter after a 13 year long hiatus as seen in the authors image below – coincidentally taken the same day as JunoCam’s first image from orbit. Welcome to Jupiter! NASA’s Juno spacecraft is orbiting Jupiter at this moment! “NASA did it again!” pronounced an elated Scott Bolton, investigator of Juno from Southwest Research Institute in San Antonio, to loud cheers and applause from the overflow crowd of mission scientists and media gathered at the post orbit media briefing at NASA’s Jet Propulsion Laboratory (JPL) in Pasadena, Calif.
After a nearly five year journey covering 1.7-billion-miles (2.8-billion-kilometers) across our solar system, NASA’s basketball court-sized Juno orbiter achieved orbit around Jupiter, the ‘King of the Planets’ late Monday night, July 4, in a gift to all Americans on our 240th Independence Day and a gift to science to elucidate our origins. And the science is all about peering far beneath the well known banded cloud tops for the first time to investigate Jupiter’s deep interior with a suite of nine instruments, and discover the mysteries of its genesis and evolution and the implications for how we came to be. Solar powered Juno successfully entered a polar elliptical orbit around Jupiter after completing a must-do 35-minute-long firing of the main engine known as Jupiter Orbital Insertion or JOI. The spacecraft approached Jupiter over its north pole, affording an unprecedented perspective on the Jovian system – “which looks like a mini solar system” – as it flew through the giant planets intense radiation belts in ‘autopilot’ mode. “The mission team did great. The spacecraft did great. We are looking great. It’s a great day,” Bolton gushes. Engineers tracking the telemetry received confirmation that the JOI burn was completed as planned at 8:53 p.m. PDT (11:53 p.m. EDT) Monday, July 4. 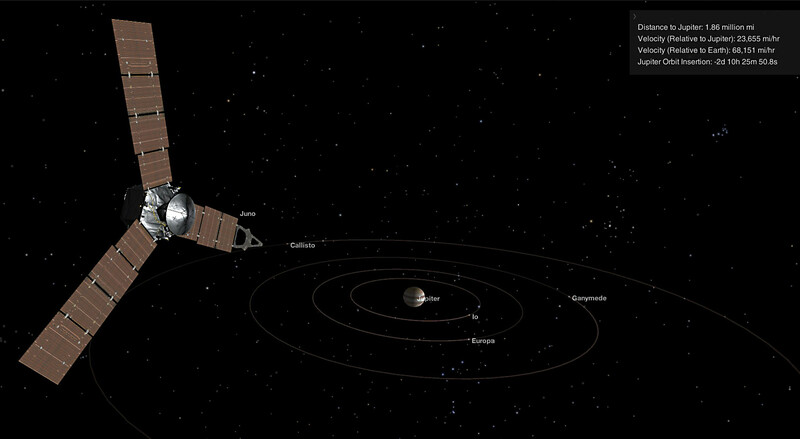 Juno is only the second probe from Earth to orbit Jupiter and the first solar powered probe to the outer planets. The gas giant is two and a half times more massive than all of the other planets combined. “Independence Day always is something to celebrate, but today we can add to America’s birthday another reason to cheer — Juno is at Jupiter,” said NASA administrator Charlie Bolden in a statement. The do-or-die burn of Juno’s 645-Newton Leros-1b main engine started at 8:18 p.m. PDT (11:18 p.m. EDT), which had the effect of decreasing the spacecraft’s velocity by 1,212 miles per hour (542 meters per second) and allowing Juno to be captured in orbit around Jupiter. There were no second chances. All of the science instruments were turned off on June 30 to keep the focus on the nail-biting insertion maneuver and preserve battery power, said Bolton. “So tonight through tones Juno sang to us. And it was a song of perfection. After a 1.7 billion mile journey we hit tour burn targets within one second,” Rick Nybakken, Juno project manager from JPL, gleefully reported at the briefing. To accomplish the burn, the spacecraft first had to adjust it’s attitude to point the engine in the required direction to slow the spacecraft and then simultaneously also had the effect that the life giving solar panels were pointing away from the sun. It the only time during the entire mission at Jupiter that the solar panels were in darkness and not producing energy. The spacecraft’s rotation rate was also spun up from 2 to 5 revolutions per minute (RPM) to help stabilize it during JOI. Juno is spin stabilized to maintain pointing. After the burn was complete, Juno was spun down and adjusted to point to the sun before it ran out of battery power. We have to get the blood flowing through Juno’s veins, Bolton emphasized. It is equipped with 18,698 individual solar cells over 60 square meters of surface on the solar arrays to provide energy. Juno is spinning like a windmill through space with its 3 giant solar arrays. It is about 540 million miles (869 million kilometers) from Earth. Signals traveling at the speed of light take 48 minutes to reach Earth, said Nybakken. So the main engine burn, which was fully automated, was already over for some 13 minutes before the first indications of the outcome reach Earth via a series of Doppler signals and tones. “Tonight, 540 million miles away, Juno performed a precisely choreographed dance at blazing speeds with the largest, most intense planet in our solar system,” said Guy Beutelschies, director of Interplanetary Missions at Lockheed Martin Space Systems. “The spacecraft is now pointed back at the sun and the antenna back at Earth. The spacecraft performed well and did everything it needed to do,” he reported at the briefing. “Juno is also the farthest mission to rely on solar power. And although they provide only 1/25th the power at Earth, they still provide over 500 watts of power at Jupiter,” said Nybakken. Initially the spacecraft enters a long, looping polar orbit lasting about 53 days. That highly elliptical orbit will be trimmed to 14 days for the regular science orbits. The orbits are designed to minimize contact with Jupiter’s extremely intense radiation belts. The nine science instruments are shielded inside a ½ thick vault built of Titanium to protect them from the utterly deadly radiation of some 20,000,000 rads. During a 20 month long science mission – entailing 37 orbits lasting 14 days each – the probe will plunge to within about 3000 miles of the turbulent cloud tops and collect unprecedented new data that will unveil the hidden inner secrets of Jupiter’s origin and evolution. But the length and number of the science orbits has changed since the mission was launched almost 5 years ago in 2011. Originally Juno was planned to last about one year with an orbital profile involving 33 orbits of 11 days each. I asked the team to explain the details of how and why the change from 11 to 14 days orbits and increasing the total number of orbits to 37 from 33, especially in light of the extremely harsh radiation hazards? “The original plan of 33 orbits of 11 days was an example but there were other periods that would work,” Bolton told Universe Today. “So we still retained that conservatism as well and the overall radiation dose was pretty much the same,” Bolton explained. “The radiation we accumulate is not just the more time you spend the more radiation,” Steve Levin, Juno Project Scientist at JPL, told Universe Today. Juno is the fastest spacecraft ever to arrive at Jupiter and was moving at over 165,000 mph relative to Earth and 130,000 mph relative to Jupiter at the moment of JOI. Juno’s principal goal is to understand the origin and evolution of Jupiter. “With its suite of nine science instruments, Juno will investigate the existence of a solid planetary core, map Jupiter’s intense magnetic field, measure the amount of water and ammonia in the deep atmosphere, and observe the planet’s auroras. The mission also will let us take a giant step forward in our understanding of how giant planets form and the role these titans played in putting together the rest of the solar system. As our primary example of a giant planet, Jupiter also can provide critical knowledge for understanding the planetary systems being discovered around other stars,” according to a NASA description. Bolton also released new views of Jupiter taken by JunoCam – the on board public outreach camera that snapped a final gorgeous view of the Jovian system showing Jupiter and its four largest moons, dancing around the largest planet in our solar system. The newly released color image was taken on June 29, 2016, at a distance of 3.3 million miles (5.3 million kilometers) from Jupiter – just before the probe went into autopilot mode. It shows a dramatic view of the clouds bands of Jupiter, dominating a spectacular scene that includes the giant planet’s four largest moons — Io, Europa, Ganymede and Callisto. Scott Bolton and NASA also released this spectacular new time-lapse JunoCam movie at today’s briefing showing Juno’s approach to Jupiter and the Galilean Moons. Along the 5 year journey to Jupiter, Juno made a return trip to Earth on Oct. 9, 2013 for a flyby gravity assist speed boost that enabled the trek to the Jovian system. During the Earth flyby (EFB), the science team observed Earth using most of Juno’s nine science instruments including, JunoCam, since the slingshot also served as an important dress rehearsal and key test of the spacecraft’s instruments, systems and flight operations teams. The JunoCam images will be made publicly available to see and process. During the Earth flyby, Junocam snapped some striking images of Earth as it sped over Argentina, South America and the South Atlantic Ocean and came within 347 miles (560 kilometers) of the surface. To achieve orbit, Juno must will perform a suspenseful maneuver known as ‘Jupiter Orbit Insertion’ or JOI tonight, Monday, July 4, upon which the entire mission and its fundamental science hinges. There are no second chances! You can be part of all the excitement and tension building up to and during that moment, which is just hours away – and experience the ‘Joy of JOI’ by tuning into NASA TV tonight! And for a breathtaking warm-up act, Juno’s on board public outreach JunoCam camera snapped a final gorgeous view of the Jovian system showing Jupiter and its four largest moons, dancing around the largest planet in our solar system. The spacecraft is approaching Jupiter over its north pole, affording an unprecedented perspective on the Jovian system – “which looks like a mini solar system,” said Juno Principal Investigator and chief scientist Scott Bolton, from the Southwest Research Institute (SwRI) in San Antonio, Tx, at today’s media briefing at NASA’s Jet Propulsion Laboratory (JPL) in Pasadena, Calif. The 35-minute-long main engine burn is preprogrammed to start at 11:18 p.m. EDT (8:18 p.m. PST, 0318 GMT). It is scheduled to last until approximately 11:53 p.m. (8:53 p.m. PST, 0353 GMT). All of the science instruments were turned off on June 30 to keep the focus on the nail-biting insertion maneuver and preserve battery power, said Bolton. Solar powered Juno is pointed away from the sun during the engine firing. JOI is required to slow the spacecraft so it can be captured into the gas giant’s orbit as it closes in over the north pole. Initially the spacecraft will enter a long, looping polar orbit lasting about 53 days. That highly elliptical orbit will quickly be trimmed to 14 days for the science orbits. The orbits are designed to minimize contact with Jupiter’s extremely intense radiation belts. The science instruments are shielded inside a ½ thick vault built of Titanium to protect them from the utterly deadly radiation – of some 20,000,000 rads. Artist’s concept of NASA’s Juno spacecraft crossing the orbits of Jupiter’s four largest moons — Callisto, Gaynmede, Europa and Io — on its approach to Jupiter. Juno is the fastest spacecraft ever to arrive at Jupiter and is moving at over 165,000 mph relative to Earth and 130,000 mph relative to Jupiter. After a five-year and 2.8 Billion kilometer (1.7 Billion mile) outbound trek to the Jovian system and the largest planet in our solar system and an intervening Earth flyby speed boost, the moment of truth for Juno is now inexorably at hand. Signals traveling at the speed of light take 48 minutes to reach Earth, said Rick Nybakken, Juno project manager from NASA’s Jet Propulsion Laboratory, at the media briefing. So the main engine burn, which is fully automated, will already be over for some 13 minutes before the first indications of the outcome reach Earth via a series of Doppler shifts and tones. It is about 540 million miles (869 million kilometers) from Earth. “The engine burn will slow Juno by 542 meters/second (1,212 mph) and is fully automated as it approaches over Jupiter’s North Pole,” explained Nybakken. As it travels through space, the basketball court sized Juno is spinning like a windmill with its 3 giant solar arrays. The protective cover that shields Juno’s main engine from micrometeorites and interstellar dust was opened on June 20. During the orbits, Juno will probe beneath the obscuring cloud cover of Jupiter and study its auroras to learn more about the planet’s origins, structure, atmosphere and magnetosphere. Along the way Juno made a return trip to Earth on Oct. 9, 2013 for a flyby gravity assist speed boost that enabled the trek to Jupiter. The flyby provided 70% of the velocity compared to the Atlas V launch, said Nybakken. During the Earth flyby (EFB), the science team observed Earth using most of Juno’s nine science instruments since the slingshot also serves as an important dress rehearsal and key test of the spacecraft’s instruments, systems and flight operations teams. Juno also went into safe mode – something the team must avoid during JOI. What lessons were learned from the safe mode event and applied to JOI, I asked? Junocam also took some striking images of Earth as it sped over Argentina, South America and the South Atlantic Ocean and came within 347 miles (560 kilometers) of the surface. For example the dazzling portrait of our Home Planet high over the South American coastline and the Atlantic Ocean. Now just 7 days out from a critical orbital insertion burn, NASA’s Jupiter-bound Juno orbiter is closing in fast on the massive gas giant. And as its coming into focus the spacecraft has begun snapping a series of beautiful images of the biggest planet and its biggest moons. In a newly released color image snapped by the probes educational public outreach camera named Junocam, banded Jupiter dominates a spectacular scene that includes the giant planet’s four largest moons — Io, Europa, Ganymede and Callisto. Junocam’s image of the approaching Jovian system was taken on June 21, 2016, at a distance of 6.8 million miles (10.9 million kilometers) and hints at the multitude of photos and science riches to come from Juno. Rather appropriately for an American space endeavor, the fate of the entire mission hinges on do or die ‘Independence Day’ fireworks. On the evening of July 4, Juno must fire its main engine for 35 minutes. The Joy of JOI – or Jupiter Orbit Insertion – will place NASA’s robotic explorer into a polar orbit around the gas giant. The approach over the north pole is unlike earlier probes that approached from much lower latitudes nearer the equatorial zone, and thus provide a perspective unlike any other. And preparations are in full swing by the science and engineering team to ensure a spectacular Fourth of July fireworks display. The team has been in contact with Juno 24/7 since June 11 and already uplinked the rocket firing parameters. Signals traveling at the speed of light take 10 minutes to reach Earth. “And the software program that will command the spacecraft through the all-important rocket burn was uplinked,” says NASA. The pressurization of the propulsion system is set for June 28. “We have over five years of spaceflight experience and only 10 days to Jupiter orbit insertion,” said Rick Nybakken, Juno project manager from NASA’s Jet Propulsion Laboratory in Pasadena, California, said in a statement. On the night of orbital insertion, Juno will fly within 2,900 miles (4,667 kilometers) of the Jovian cloud tops. All instruments except those critical for the JOI insertion burn on July 4, will be tuned off on June 29. That includes shutting down Junocam. “If it doesn’t help us get into orbit, it is shut down,” said Scott Bolton, Juno’s principal investigator from the Southwest Research Institute in San Antonio. During a 20 month long science mission – entailing 37 orbits lasting 11 days each – the probe will plunge to within about 3000 miles of the turbulent cloud tops and collect unprecedented new data that will unveil the hidden inner secrets of Jupiter’s origin and evolution. Junocam has already taken some striking images during the Earth flyby gravity assist speed boost on Oct. 9, 2013. For a hint of what’s to come, see our colorized Junocam mosaic of land, sea and swirling clouds, created by Ken Kremer and Marco Di Lorenzo. As Juno sped over Argentina, South America and the South Atlantic Ocean it came within 347 miles (560 kilometers) of Earth’s surface. During the flyby, the science team observed Earth using most of Juno’s nine science instruments since the slingshot also serves as an important dress rehearsal and key test of the spacecraft’s instruments, systems and flight operations teams.